The Ayleids, also known as the Heartland High Elves or Wild Elves, were the first race to establish an empire in Tamriel, and had ruled modern-day Cyrodiil for countless years dating back to before recorded history. Ayleidoon, their language, is similar to Aldmeris, the ancient language of the Aldmer. The Ayleids were the original founders of the Imperial City, which they called the "Temple of the Ancestors". However, their empire collapsed in the early First Era. While it's believed that the Ayleids remain in the wilds of every province on Tamriel, sightings have been few. There have been no known sightings in the Third or Fourth Eras. Much like how the ruins of the lost Dwemer dot Hammerfell, Skyrim, and Morrowind, the Ayleids have left ruins scattered around Cyrodiil and other regions which were once under the dominion of their Empire. These underground cities can prove deadly for adventurers, hiding such dangers as traps, monsters, undead, and criminals. Their cities were amazing feats of architecture ranging from small settlements to gigantic, labyrinth-like metropolises shaped out of whitish rock. They also seem to have had a firm grasp of the magical arts, as many of their ruins contain stones filled with magicka essences harvested from the sky. They also developed what came to be called the school of Alteration, as they were skilled in magics such as shapeshifting and levitation. As for their appearance, like all elves, they were most likely thin and lean with pointed ears and angular facial features. Their complexion was lighter than that of the Dunmer, but they were darker than Altmer. They preserved many of the ancient runes and Dawn Era magics of the Ehlnofey that other elves had forgotten. The prophecies of the moth-eyed foretold that Ayleidic hubris would "bear bitter fruit", a warning that many, apparently, failed to heed. It would be their undoing. "Wear lore as your armor." The Ayleids began as groups of mer who left the Summerset Isles to create splinter cultures in central and southwest Tamriel. The first left in the Middle Merethic Era, after the area had been charted by Topal the Pilot and others, or in the Dawn Era. In some cases, they left specifically to evade the strictures of Aldmeri regulation, which forbade (among many other things) the worship of Daedra. Though they settled predominantly in Cyrodiil, the "Barsaebic Ayleids" also had settlements in modern-day Black Marsh. The cities Gideon and Stormhold were originally Ayleid settlements whose names have been lost to history. The earliest Aldmeri account of the Heartlands of Cyrodiil from Topal the Pilot speaks of friendly feathered Bird Men who resided there, but these natives disappeared from history, only to be replaced by the Ayleids. Far away from Alinor, Ayleidic culture flourished. In the last millennium of the Merethic Era, Daedric worship took hold and spread among the Heartland High Elves. 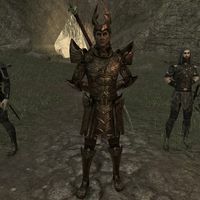 The cults devoted to the various Daedric Princes which had sprung up across Cyrodiil, once merely tolerated, became celebrated. Unlike the Chimer who left Summerset in the Late Middle Merethic Era, the Ayleids made no distinction between "good and bad" Daedra. Even some of the more heinous Princes received mass veneration, especially when their worship was adopted and endorsed by Ayleid kings and aristocrats. The Ayleids made deals with Daedra for more power, blessings, and other advantages. They employed entire armies of Daedra to conquer, subjugate, and enforce their rule. In the earliest Cyro-Nordic stories, Shezarr fought against the Ayleids on mankind's behalf, then vanished, presumably to go help humans elsewhere. Without his leadership, the Ayleids dominated and enslaved the men of Cyrodiil. At first this enslavement of the Nedic peoples was occasional, but eventually became a systematic, widespread institution of their society. They eventually controlled the entirety of modern-day Cyrodiil, and kept the Nedic peoples there enslaved for generations. The Ayleids are also said to have enslaved beastfolk. The example of the Nords to the north inspired the Alessian Slave Rebellion of 1E 242. Alessia's rebellion coincided with a civil war within the Ayleid Empire which led to many rebel Ayleid lords joining forces with Alessia and aiding her rebellion. These allies of Alessia were largely Aedra-worshippers, indicating that the schism among the Ayleids was likely related to religious differences. Skyrim, of course, lent help to their enslaved relatives under the Ayleid Empire, which also played a part in the Ayleids being overthrown. In only a year, the Slave Queen Alessia and her supporters had taken the White-Gold Tower, founded the Alessian Empire, and secured the subsequent shift in power from mer to men on Tamriel. "Our exiled Elven ancestors heard the welcoming gifts of peace in the streams and beech trees and stars." The Alessian Slave Rebellion was devastating to the Ayleids. Legend says entire settlements were slaughtered at the hands of Alessia's champion, Pelinal Whitestrake. 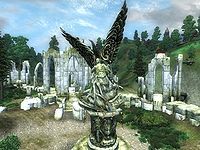 Though the Ayleids would continue to have a presence in Cyrodiil for several hundred years, the fall of the White-Gold Tower in 1E 243 signaled the beginning of the Late Ayleid Period. The tower was turned into the Imperial Palace by Alessia and her descendants, and it remains so to this day. The Bravil region was one of the very last areas to be liberated by the Alessian army. It took Alessia's forces, led by Bravillius Tasus, four attempts to finally defeat them. In these early years, the Alessian Empire forbade the worship of the Daedric Princes and focused on hunting down and exterminating Daedra-worshipping Ayleids. Ayleidic culture lingered in the Aedra-worshipping city-states that survived as client kingdoms of Alessian Cyrodiil, but resentment at the continued presence of Ayleid nobles within the Empire was a contributing factor to the rise of the so-called Alessian Order founded by Marukh. In 1E 361, the Alessians gained control of the Empire and enforced the Alessian Doctrines throughout its domain. The Ayleid lordships were abolished. Enforcement of this decree does not appear to have required much direct violence — it seems that by this point the balance of power was so overwhelmingly against them, and their fate so long foreshadowed, that most of the remaining Ayleids simply left Cyrodiil, eventually being absorbed into the elven populations of Valenwood and High Rock. It's speculated that the exodus of the Ayleids from Cyrodiil may have vastly strengthened the Direnni Hegemony in High Rock - in which case, the Ayleids had their revenge, as the war with the Direnni eventually crippled the Alessian Empire and brought about its fall. The only known Ayleids who remained in Cyrodiil served as mentors and tutors for the new human nobility. The last remaining kingdom of the Ayleids, Nenalata, was last heard of in 1E 482 at the Battle of Glenumbria Moors. Following the battle, the so-called last king of the Ayleids, Laloriaran Dynar, was lured back to Nenalata and tricked by Molag Bal to henceforth serve as a prisoner in Coldharbour. Whether Laloriaran Dynar's people made it through the next few centuries is unknown, but this was a significant event: the Late Ayleid Period was ended, and the Ayleids would never again be seen as a military or political power. It is possible that some tribes of Ayleids may continue to live deep within the forests of Cyrodiil even into modernity, yet the most recent reported sightings are more than 1000 years old. These Ayleids, or Wild Elves, are at best a rarity and may not have actually survived into modern times. "In the caverns of lore, ugly and obscure, shines the gold of truth." Ayleidic society was an alliance of kingdoms united under one empire, which ultimately ended in 1E 243 with the death of their champion, Umaril the Unfeathered, and the fall of the White-Gold Tower. The impact of the loss of the Ayleids' tower, what they called the "Temple of the Ancestors", should not be underestimated. They had built it in emulation of the Adamantine Tower, and made the Chim-el-Adabal, which they believed to be the crystallized blood of the Heart of Lorkhan, into the tower's Founding-Stone. It is the site where the Ten Ancestors, statues sacred to the Ayleids, were traditionally held. They were spread to various other settlements during the siege of the White-Gold Tower for safekeeping, but were not reunited again until the late Third Era, long after the fall of the Ayleids. Ayleids frequently adorned themselves with feathers and magic beads. They are said to have been "obsessed" with the number eight (which may have been why the pantheon Saint Alessia created was made up of Eight Divines). Most humans, at least, agree that the Ayleids' fall from power, if not their extinction, is for the better, as the portrayals of them passed down by their former slaves are not kind. Their scholars label the Ayleids as bellicose and arrogant, and point to this being the ultimate reason for their downfall. Slaves were utilized by the Ayleids for a variety of purposes, including agricultural work, entertainment, and the building and maintenance of their empire's infrastructure. According to legend, the Ayleids literally turned cruelty into an art form, and many Daedra-worshipping Ayleids across Cyrodiil derived strange pleasures from "art-tortures". Typically, Ayleid kingdoms where the most malevolent Daedric Princes were worshipped also proved to exhibit the worst treatment of their slaves. Various settlements became famous for their particular, elaborate method of torturing their slaves, such as "wailing wheels", "gut gardens", "flesh-sculptures", and forced ingestion of hallucinogenic drugs, as well as nighttime "tiger sport", which involved the immolation of human children. Magic was an enormous part of their society. In accordance with High Elf religion, they believed Nirn was composed of four basic elements: earth, water, air, and light (as opposed to the four elements of modern natural philosophy: earth, water, air, and fire). The most sublime form was starlight, as the stars were the link between Mundus and Aetherius. Some of their magic tapped into the power of the weather. They used aetherial fragments which fell from the heavens, particularly meteoric iron, to construct receptacles which are believed to harness energy from starlight. These "Ayleid Wells" are scattered all over Cyrodiil, and can still be used by mages to replenish their energy. The logic used in their placement is a mystery, and none are known to be associated with any particular Ayleid settlements. They kept specially cut pieces of meteoric glass known as Welkynd Stones (meaning literally "sky children") as storage containers for magical energy, as well what are called Varla Stones (or "star stones"),. This was still an emerging technology when the Alessian Slave Rebellion brought about the decline and disappearance of their society. Some of these crystals had the capacity to store and release memories directly to the reader; overuse of these crystals can cause a 'problem of capacity' for mortals. As the kingdoms of the Ayleids dwindled, they apparently adapted to a more rural, elusive, and possibly nomadic lifestyle. Any remaining Ayleids are unknown; if they continue to exist, they are likely living in hiding. The Ayleid Sage Tjurhane Fyrre (1E 2790 - 2E 227) talked and wrote extensively of the state of the Ayleids' culture. According to Fyrre, the Ayleids of his time lived in a tribal society, with each "tribe" being substantially different from the next. The Ayleid settlements in modern-day Black Marsh were particularly far removed from the culture of the heartlands, and were never attacked by the Alessian armies. It's not clear how these settlements met their fate. Few blanket statements can be made about Ayleidic religion. They began as splinter groups, and they were never totally united in their beliefs. But while they are most well-known to historians for being "godless" and "Daedra-loving", their society was fundamentally dedicated to the veneration of the Aedra, not the Daedra, until the last millennium of the Merethic Era. Given the importance of magic in their society, it is unsurprising that at least some city-states are known to have venerated Magnus, the god of magic and the Aedra's absent comrade. Scholars have also concluded, though, that the Daedric Prince Meridia, who they knew as Merid-Nunda, represented for them the personification of the most-sacred element of light. Even after the Daedric cults rose to power (discussed above), many Ayleidic kingdoms continued to honor the Aedra. Many slaves in Cyrodiil became Aedra-worshippers by adopting many of the beliefs of their masters, and it's suspected that Alessia incorporated elven Aedra into her Eight Divines pantheon in order to appease her Ayleid and Ayleid-influenced vassals. Ayleids venerated their ancestors, and Aedra is an Elven word for "ancestor". Ayleid statues throughout Cyrodiil depict an eagle lifting up a figure carrying a bow and shield from the ensnaring ground. The bow and shield are the weapons associated with the Aedra Auri-El. For the Altmer, the eagle represents the Aedra,[UOL 1] and Ayleids presumably inherited this symbolism, as well. An NPC in an Oblivion quest makes reference to the possibility of "Ayleid Revivalists", the events of the quest suggest some fanatics wish to see the rise of the Ayleids once more. 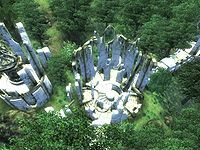 For a list of Ayleid ruins which appeared across games, see the Oblivion and ESO articles. For the Ayleid language, see their language page. A Life of Strife and Struggle by King Laloriaran Dynar — Notes for the personal memoirs of King Laloriaran Dynar, "Last King of the Ayleids"
^ a b c Umbacano's dialogue in Oblivion. ^ Decentius Opsius' dialogue in Oblivion. ^ a b Herminia Cinna's dialogue in Oblivion. ^ Answers from ZeniMax regarding Elder Scrolls Online. This page was last modified on 29 March 2019, at 22:09.